Take advantage of this incredible deal on Nexsan E-Series. 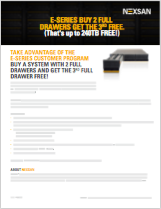 When you purchase an E-Series and buy two full drawers, you will get the third drawer for FREE. Fill out the form to learn more about the promo and how we can solve your storage challenges.